Old vs New Range Rover Tug of War! Place Your Bets! - Muscle Cars Zone! Old vs New Range Rover Tug of War! Place Your Bets! We have all witnessed a tug of war, typically those where two groups of people pull the rope at both ends. But this is not your regular tug of war. This tug of war features two Range Rovers. British people decided to test out the old Range Rover versus the new Range Rover. They parked the vehicles in a way so that they face their backs and tied a strong rope. Though this might look interesting, it can be dangerous as well. 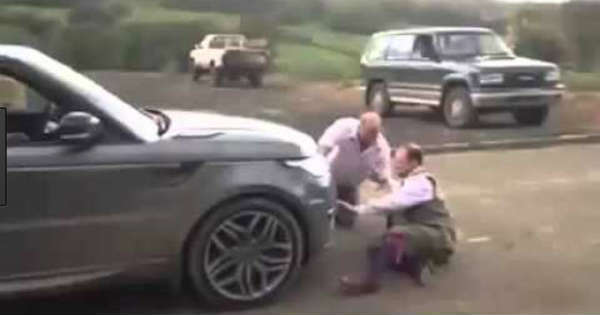 Just a fraction of carelessness could turn this Range Rover tug of war into a disaster. As the vehicles are prepared, the old Range Rover starts off furiously but the new one withstands the force. The new Range Rover then pushes the throttle and drags the old Range with an ease. Does this prove that new technology is always better? Well, some argue that the new Range Rover had better set of wheels so the traction was way better, but still, its` more intelligent 4×4 system and the direction of power was enough to beat the old Range. The old mechanical transfer box did not have any chance. Can you think of any other classic tug of war? At last, don’t miss the ultimate tug of war between Dodge Ram & GMC Duramax!